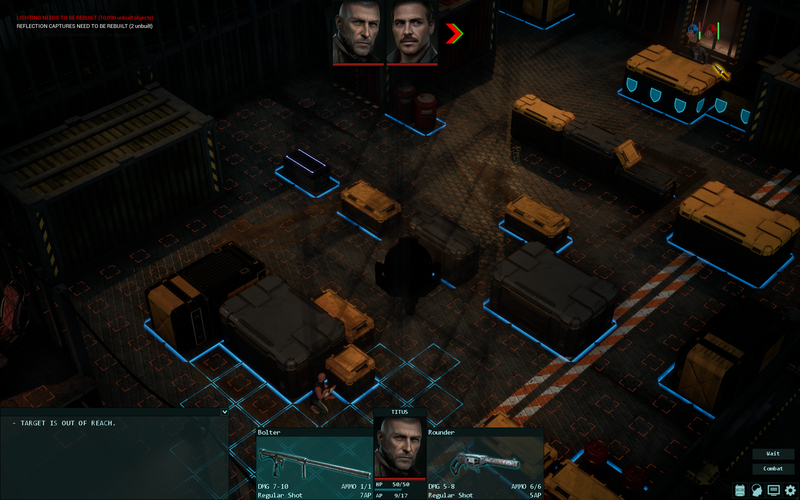 After nearly 2 years of work we finally have a playable build, which is very exciting. First, we finally get to see how things work in-game, not on paper, and second, it's great to see the game rapidly changing with every daily update. 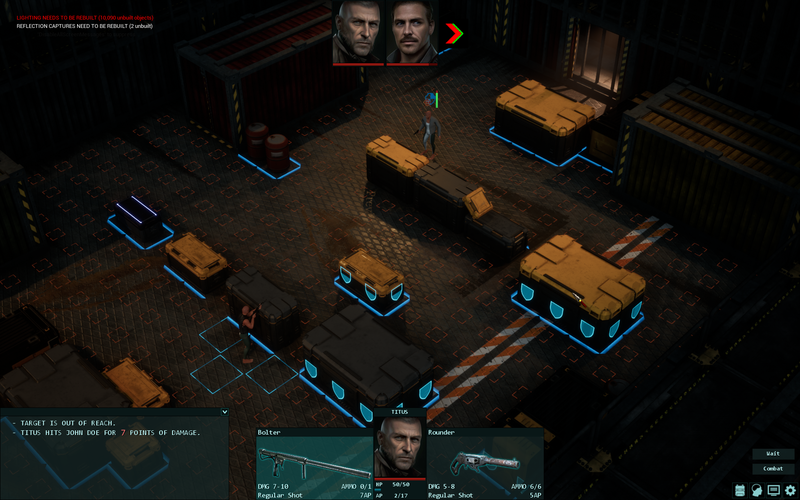 It's very rough, of course, as it's the First Iteration: a promise of things to come rather than an actual game, but the promise IS there and it's a good thing. 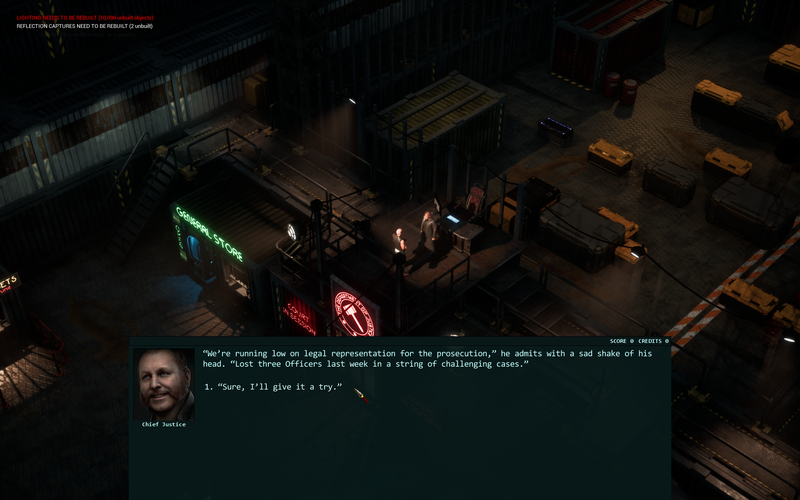 Right now you can talk to people, fight, loot bodies, increase skills and equip new gear. 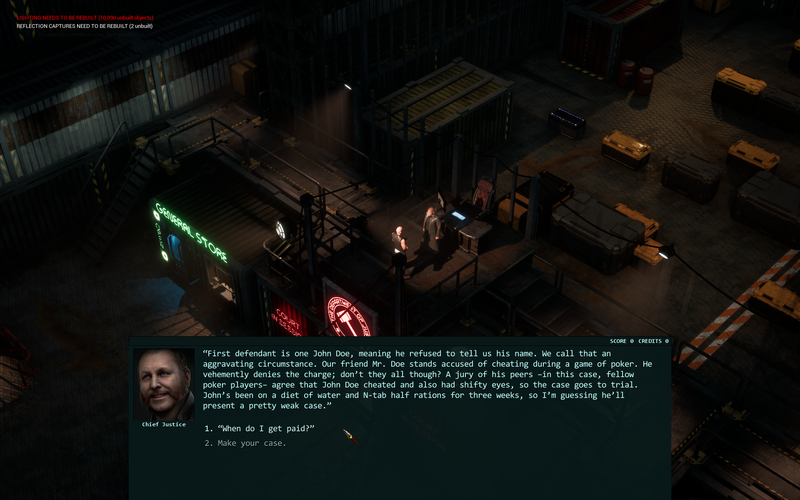 The dialogue scripts are working like a charm, so you can go through all the fights and get one of 5 endings. The AI is doing a pretty good job seeking cover, flanking, and using different attacks. 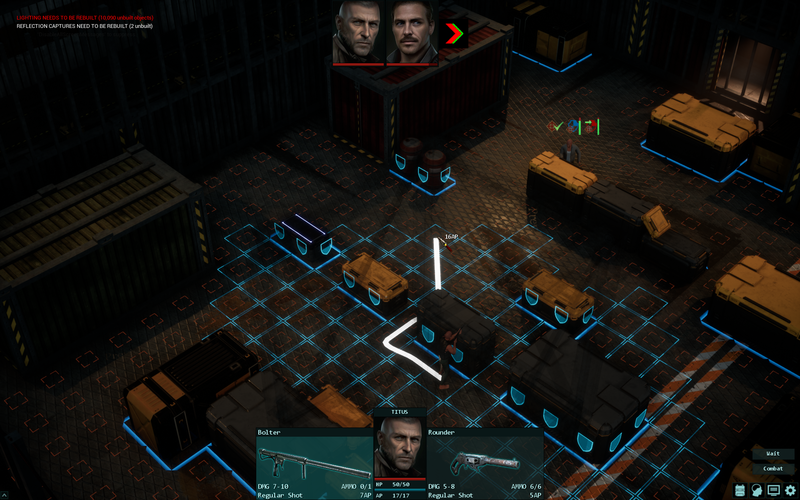 Collapsible textbox, pop-up attack icons with tooltips, status icons that tell you which enemies your character has a line of sight on, if the enemies are in cover, and most importantly, if you're still in cover when the enemies are flanking you; the cover provides the highest bonus when the cover is between you and the enemy; less when the enemy is at an angle), etc. 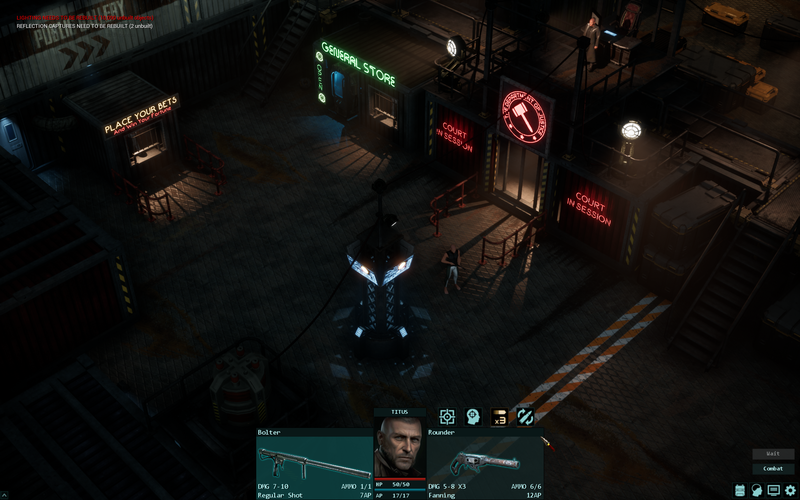 The only feature that's not done yet is the gadgets (energy shield and such), which gives us time to focus on the basic mechanics, iron them out, then introduce the gadgets. The armor sets are almost done, waiting to be textured. Plus tons of small things like various GUI improvements, proper textbox messages that show rolls Battle Brothers style (it's much easier to accept missing 3 times in a row when you see what you're rolling), blood splatters, a balance pass or two (changed AP from DEX+10 to DEX*1.5+5, working on the attack and weapon stats now), the cursor, etc. All in all, I'd say we need 2 months to get the combat system into shape before we start beta-testing, then another month before we release it. It's longer than we expected but late is always better than never. In comparison, it took us over 5 years to reach this point with AoD (due to working part-time and being inexperienced), so overall the game is progressing nicely. Merry Christmas and a Happy New Year to you and your families. A "weak case"... Oh, dear! All the firearms seem very crude even for improvised machinery standards so they must surely all belong to the lowest-of-the-low/entry category. Pretty realistic balancing of stats for rifle vs. revolver (at roughly the same quality level). In one of the screenshots, there are 3 icons above John Doe's head. What do they represent exactly? The cargo containers used for cover look pretty futuristic and Star Trek-ish. The square markers on the ground give a good indication of the size and layout of the place. Simply highlighting where you can/can't go looks way better without any ground colors involved which could have posed a potential challenge to color-blind people and also detract from the beauty of the environment. The highlight ending at the limit of your reach instead of the entire area looking like a giant chessboard is nice as well. The highlighting of potential covers in the entire area is also nice. Gives one a good idea where a sniper might be better positioned. The image behind the character's avatar in the menu is a nice addition. Aaand... it looks like it's a blurred front view of "The Promised Land". Is it going to change depending on where you are? (obviously not important at any point, least of all in this very early incarnation, just curious as to your vision). Personally, I think it's coming along quite nicely. Tier 1 - crappy weapons made from available parts: pipes, hydraulic cylinders, air pumps, and such. Homemade weapons, basically. Tier 2 - slightly better weapons: same available parts, better tools and craftsmanship. 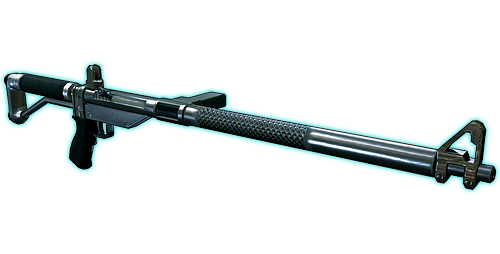 Tier 3 - good weapons made from machined parts. Tier 4 - great weapons made by engineers with access to proper workshops. Tier 5 - Earth-made energy weapons. Line of sight, your cover, his cover. Hmmm, interesting symbols... Line of sight also has a check on it which I assume means that one can take the shot. The other 2 icons exhibit a progress bar with the green part being the level of protection and the red part the odds of being hit. Did I get it right? If I did get it right, then John Doe seems to enjoy a little more effective cover. And since both containers offer maximum protection, it must be due to something else. What other factors come into play in such a situation? Beautiful work guys! As always! The smile on the Chief Justice's face is absolutely golden! Gave me a laugh as he looks like he truly enjoys his job. The combat icons look very slick. A small suggestion if I may? 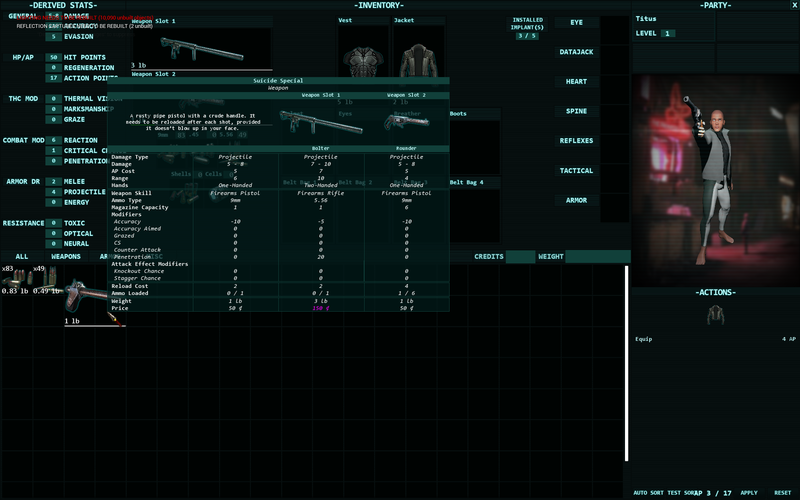 The accented lined "header" (for lack of a better term) on the top of the the inventory looks great compared to the clear "header" used for the dialogue and other UI. I recommend using it. Sorry, I didn't explain clearly. This info shows you what happens when you reach that tile: whether or not you'd have the line of sight (it's obvious there but in other places it might not be as obvious), and how it would affect your and the enemy's cover. The blue shield is yours, the red is the enemy's. The green arrow represents the movement. For some reason the blue shield info wasn't updated but like I said, it's still rough. The vertical bar shows how effective the enemy's cover is from that particular angle. I know it's confusing and we need a better way to present and explain the info in-game. Thank you very much for the update and merry christmas! - The icons for the different attacks should be displayed all the time, because the height difference between the portrait and the weapon slots looks strange. - The transparency of the blue lines and the cover icons is too low, because they attract too much attention. - The small red squares should be removed, because they attract too much attention and the movement cost is displayed with the tooltip. - The movement path should be displayed with highlighted squares and not a line, because the movement is based on squares. - Why is the chance to hit the target 45 %? It should be 25 % (50 + 10 + 20 - 10 - 10 - 25 - 10 = 25). - Why is the chance to miss the target 40 %? It should be 60 % (100 - 5 (Crit (looks better than CS) - 25 (Hit) - 10 (Graze) = 60). 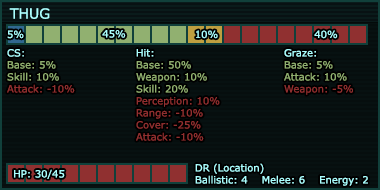 The red squares are not movement costs, they are the range of the weapon. Because it's a mock-up with made up numbers, just to show the style, we are implementing that right now. Tier 1 and 4 should theoretically turn out to be the most interesting. Tier 1 for being utter curiosities, monstrosities born out of scavenged parts that are almost just as likely to kill the shooter as the shot upon and Tier 4 could be inspired by real-life latest designs featuring plastics and other composites, thermal sights and the likes, but you could let your imagination work along those lines. Tier 2 should be very similar to Tier 1 so after seeing the latter, one won't find the former as amusing. With Tier 3, I think you guys can simply emulate a few of the gazillion "good weapon" designs out there. An AK-47 look-alike would be cool as it is by far the most successful assault rifle design in history and it makes perfect sense that every wanna-be gunsmith on the Ship would know about it and try to replicate it. Personally, I've always been fascinated with the design of the Steyr AUG. It has a unique look. Tier 5 should be the easiest to implement as there are no counterparts in RL so you can simply let your imagination run wild. As long as they're not OP as far as combat mechanics are concerned, no one should have a reason to complain about their design. Other than personal taste, of course. It will do the job just fine. Providing it doesn’t explode. Do you have any plans to implement this? It would indeed be very realistic for the improvised Tier 1 and the - in disrepair due to lack of maintenance - Tier 5, but many players aren't exactly keen on surprises of that variety. Most of our tier 1-3 weapons are inspired by or directly copied from homemade weapons used in modern conflicts. I mean why reinvent this particular wheel when there are hundreds of real life weapons that show what's possible and filter it out by skill, materials, and tools. 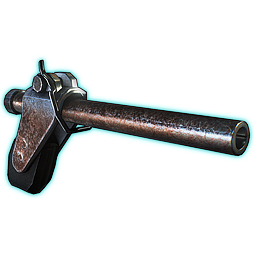 Tier 2 multi-barrel pistol: Fashioned from a discarded hydraulic cylinder, this weapon calls to mind the ancient 'pepperbox' pistol, at least in appearance. With almost zero muzzle velocity, you'll be wearing most of the blood it spills. Tier 3 rifle: The same M16 rifle that freed the United States from British rule in the 18th century. It's been the bane of the Redcoats ever since. 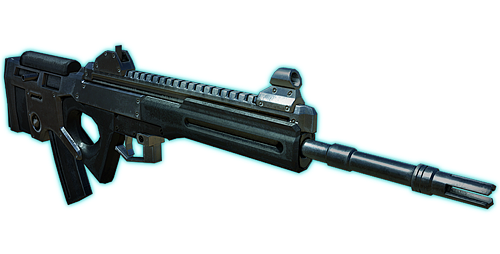 Tier 4 assault rifle: A precisely calibrated bullpup assault rifle. 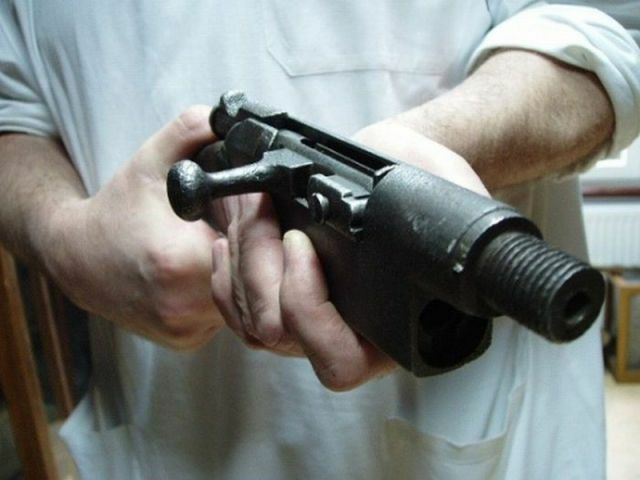 This deadly firearm was assembled by a real gunsmith from machined components instead of spare parts. Must have cost a fortune. This gilded energy pistol was an officer's side-arm before the Mutiny. A sign of authority, it was designed for marksmanship rather than rapid fire. Today it's a very expensive memento of a long-gone past, unless you have spare energy cells to burn. No plans. Such a system would require a very different approach to both weapons and combat. Graphics look really crisp and nice. Have to second comment about red squares, they overwhelm everything else, whatever they represent. Weapons range but I agree that it should be done differently. Weapon range plays a very important role. There are two ranges: effective and maximum. 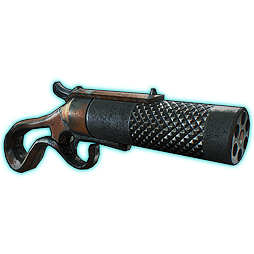 Effective is the range the weapon is designed for, so for example, a homemade shotgun's effective range will be very short. 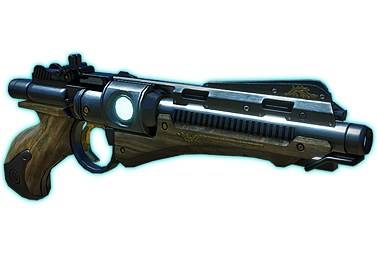 Max range is the farthest you can hit something with this weapon. You lose 10% THC with every tile beyond the effective range, so for example, my THC with the rifle on that second combat screen was 74%, with the pistol only 5% because the pistol had a low range (on account of being crappy), but I didn't have to reload after each shot, which was a huge advantage (revolvers have the highest rate of fire). Anyway, what's the best way to show the effective and max ranges without going overboard with colors? I was thinking something like a laser sight/beam that appears when you target someone and shows you both ranges. 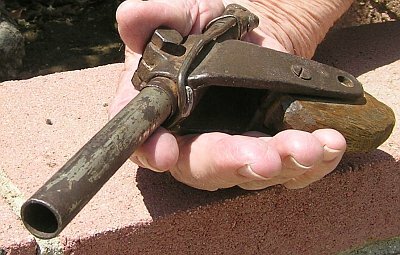 I mean why reinvent this particular wheel when there are hundreds of real life weapons that show what's possible and filter it out by skill, materials, and tools. Agreed. This way you remain true-to-life and can also direct the energy towards more critical areas, instead. I must admit, some of the weapons you posted are new to me (must've missed those updates). I knew it was still a work in progress so I thought I'd just throw in my 2 cents as food for thought. But damn, the graphics guy sure knows his trade... The rust, wear & tear on the first 2 pistols is really something. Have to second comment about red squares, they overwhelm everything else, whatever they represent. Come to think of it, they kinda are too many and too oversized. Anyway, what's the best way to show the effective and max ranges without going overboard with colors? How about a simple contour? A green one with a radius of X tiles around the player for effective range and a bigger, red one for maximum range. The red would also be adequate here as one cannot shoot past the maximum range. This would also help greatly with team positioning in the grand scheme of things. Would it be hard to implement something like this? No, the weapons are done. 84 unique models and icons, not counting grenades and gadgets. If we have time, we'll add more energy weapons. The contours might clash with the movement range. That's why I was thinking about something like a laser sight. 84 unique models and icons, not counting grenades and gadgets. Wow! I've been wondering how many weapons you were planning on when all is said and done but that's above my higher estimates. And I doubt there's anyone out there who doesn't love freedom of choice and plenty of options to choose from. Well, you ought to know best, you're the game designer... I'm having trouble imagining how the beam might work, though. The only thing that comes to mind would be when pointing the beam at an enemy, the tiles between you and said enemy would be temporarily colored with green for the ones in the effective range, yellow for the ones between effective and maximum and red for those out of reach. So if an enemy is in the "red zone", it should be pretty obvious to anyone what that means.